In On Yoga: The Architecture of Peace, photographer and yogi Michael O’Neill pays tribute to yoga’s healing power as a physical, spiritual, and mindful practice. His beautifully composed images also celebrate the linear grace of many yoga poses, as limbs and bodies stretch and balance into careful configurations. In two illustrations specially commissioned for the book, The Land of Yoga and The Roots of Yoga, artist Irene Rinaldi also explores the lines of yoga, both in the sense of its elegant, flexible asanas and in terms of the practice’s 2,500-year geneaology. 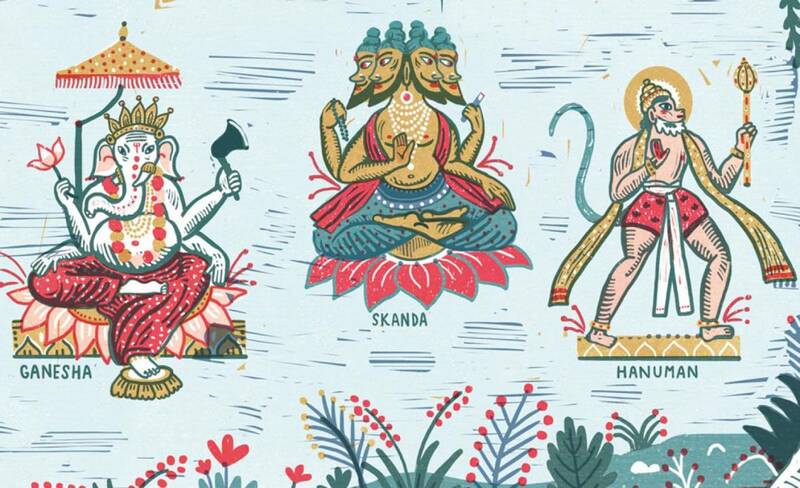 In her characteristic colorful, graphic, linocut-style aesthetics, Rinaldi, whose work appears regularly in L’Espresso and The New York Times, records the precious individuals who have handed down yoga from generation to generation, from Babaji, who first formalized the asanas, to monks meditating in the Himalayas and Krishnamacharya, the father of modern yoga. The Roots of Yoga is presented as a fold-out spread, over three feet wide.